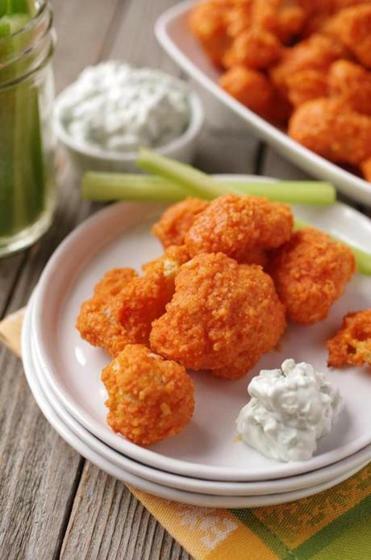 Buffalo sauce, the simple condiment of butter and hot sauce, can be used in a variety of ways besides over wings. For a vegetarian bite, steam cauliflower florets lightly and cover them with panko breading. Bake in a very hot oven and coat with Buffalo sauce. 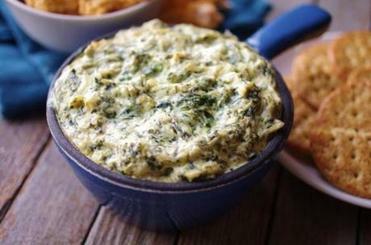 Serve with blue cheese dip and celery sticks, and you’ll find you’ve got a hit on your hands. 1. Set the oven at 425 degrees. Set a metal rack on a large rimmed baking sheet. Line a large plate with a towel. 2. In a large pot fitted with a steamer and several inches of boiling water, steam the cauliflower, covered, for 5 minutes or until tender. Transfer to the towel-lined plate and pat dry. 3. Pour the flour into a large zipper plastic bag. In a wide, shallow bowl, beat the eggs. Pour breadcrumbs into a large zipper plastic bag. 4. Working in small batches, dredge the florets first in flour, dusting off any excess. Dip into the eggs, then drop into the breadcrumb bag; shake vigorously. Transfer coated florets to the metal rack. 5. When all the florets are on the rack, set it in the oven. Bake for 20 minutes or until crisp. 6. In a small skillet over medium-high heat, heat the butter. Add the garlic and cook, stirring for 1 minute. In a large bowl, stir together the butter mixture and hot sauce. Add the cauliflower and toss well.